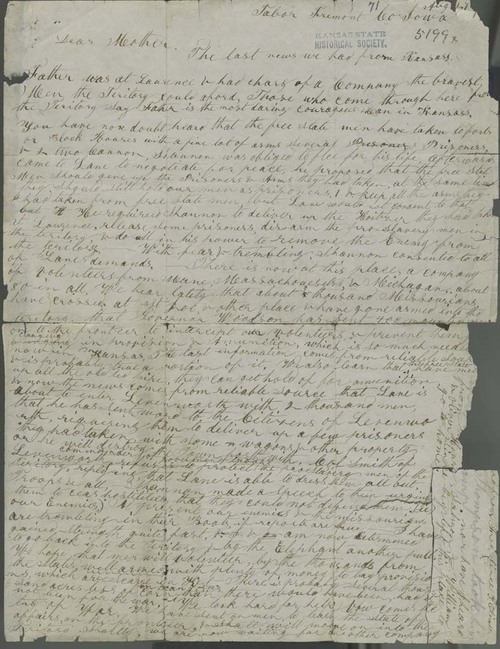 On August 27, 1856, from Tabor, Iowa, Owen Brown wrote to tell his mother that according to all accounts "Father is the most daring courageous man in Kansas" and to relate other happenings in K.T. involving Jim Lane and Governor Shannon. Another invasion from Missouri was rumored, but free state recruits were assembling and "the Missourians are trembling in their Boots."